Halifax – WCG Canada is looking for the best Warcraft 3: Frozen Throne player to represent our country at the next WCG Pan-American Championship in Mexico. This major gaming event will be held on September 11-13, in Guadalajara. All expenses will be paid for by WCG (air travel, accommodation and meals on site). This tournament will determine who will win a trip to Mexico!! A qualifying tournament will be held on Saturday, July 25th, at 7pm Eastern Time. Matches will be played 1v1 on Battle.net. Registration fees are $20 per player. Please make sure you provide your name and complete contact information otherwise your registration will be rejected. Note, you must also have a valid Canadian passport with an expiry date later than March 2010. Also confirmed is the date and venue for the WCG 2009 Canada Western Qualifier, which will be the only live event for gamers who wish to be part of Team Canada at the next WCG Grand Final in China. The top team/player from each qualifier will be invited to be part of the National Finals in Toronto, presented by Samsung Electronics Canada, from August 28-30. San Francisco – The Global Game Jam™ (GGJ) today announced the 2010 Global Game Jam and is looking for additional venues to grow this year. With 1650 participants last year across 14 different time zones and 54 venues including SFU Harbour Centre in Vancouver, the GGJ produced 370 games in just 48 hours. For 2010, the goal is to triple the size of the event to 150 locations and more than 3,000 participants. The 2010 GGJ will take place January 29-31, 2010. Game Jams foster innovation and experimentation. If you have ever wanted to make a game, be a part of a team, or go outside of your usual working method, then a game jam is for you. It’s all about making games and in the GGJ you’re part of a global experiment in creativity. A game jam is not for the faint of heart though. It’s two days of hard work, experimentation, little sleep, collaboration, cramped quarters, new friends, great idea, laughs, technical issues and the time of your life. EA Sports has announced that the release date for FIFA 10 will be available in stores internationally from October 2nd for the PLAYSTATION®3 computer entertainment system, Xbox 360® video game and entertainment system, Wii™ home video game system, PC, PlayStation®2 computer entertainment system, Nintendo DS™, PSP® (PlayStation®Portable) system and mobile. 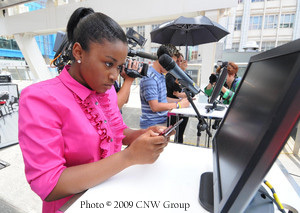 *Volunteer Canada has harnessed the power of social media to aid in matching corporate Canada with volunteer opportunities across the country. Through the Centre for Excellence in Corporate Community Involvement, businesses and non-profits from across the country are joining the nationwide membership of Volunteer Canada in an effort to better communicate and work together in partnership as they exchange ideas, best practices, tools and resources. *Microsoft Canada is giving students (proof of enrollment required) a chance to win $5000.00 in tuition aide along with other great prizes. Beginning today and continuing until 11:59 EDT Wednesday September 30, 2009, students and their family members can buy any Microsoft hardware product and enter online to win. London – Guinness World Records and Warner Bros. Digital Distribution today announced an opportunity for iPhone and iPod touch owners to become a certified Guinness World Records holder. The top player of the new Guinness World Records game app “Video Game Score” challenge, who secures the most points by August 15, 2009 will be officially crowned the iPhone gaming champion and shortlisted for inclusion in the Guinness World Records 2010 Gamer’s Edition. In order to participate, consumers will need to download the Guinness World Records Game from the App Store and create a GameSpy account so their score can be verified and recorded remotely. Once the app is installed players can roam the globe to find and enter anyone of 36 the solo or multi-play mini-games using a customisable avatar. To take part in the Guinness World Record contest players will need to navigate to the “Video Game Score” competition found in the Cape Canaveral area. With the press of a button, players can sync their score for each game to their GameSpy account. 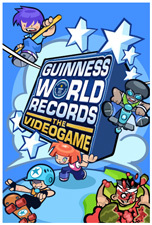 Offering endless gameplay that showcases the powerful capabilities of the iPhone and iPod touch, Guinness World Records features 36 entertaining game challenges based on real life world records. These digital competitions are as wacky and bizarre as they are challenging and fun. From crushing watermelons with the player’s head and plucking feathers from a turkey, to throwing a washing machine the farthest, all using the touch screen and motion sensing technologies of the iPhone and iPod touch, the fun never stops. San Francisco – Think Services has announced the 1st annual Independent Games Festival China (IGF China), to be held in conjunction with the 2009 Game Developers Conference China. GDC China returns to the Shanghai International Convention Center, October 11-13 of this year. Toronto – LG Electronics Canada, a leader and technology innovator in Home Electronics, has announced the inaugural LG Life’s Good FilmFest (LGfilmfest.com), a global film competition open to budding movie makers of all skill sets and abilities. Unlike most film festivals, the Life’s Good FilmFest is free to enter for film-makers, and free and open for all to enjoy this fall. Tokyo – via notice from DFAIT – Japan Prize is now accepting entries for the 2009 contest and also participant registrations for CrossMedia Forum. The Japan Prize was established in 1965 by NHK as International Educational Program Contest with the aims of improving the quality of educational programs around the world and contributing to the development and fostering of international understanding and cooperation. products with audiovisual contents. This was to cope with circumstances facing educational media including the diffusion of information-communication technologies, the initiation of digital broadcasting and the spread of the Internet in the field of education worldwide. We would like to further promote the Japan Prize in the game industry to receive more entries with high educational effects. Please feel free to explore our website to discover whether your productions may qualify for these prestigious awards. For more detailed information about entries, please see the rules for the Audiovisual Division on the Japan Prize site. Mississauga – There’s a new texting champion in Canada and her name is Kathy Spence. Today LG Electronics Canada crowned the winner of its 2nd Annual LG Canadian Texting Championship at the competition’s finals, held earlier this afternoon at Toronto’s Yonge-Dundas Square. Kathy, who is from Scarborough, received $25,000 in cash and prizes from LG’s Pat Button. Kathy coming out on top. The event, hosted by Nicole Arbour, and featuring a performance by chart-topping band, The New Cities, attracted over 1,500 spectators over the noon hour. Contestants competed on a variety of LG’s QWERTY phones including the LG Dare, LG Keybo, LG Reveal, LG Rumour and LG Voyager as well as new phones, the LG Rumour 2, LG Neon and LG Xenon. Kingston Technology Company Inc., the independent world leader in memory products, today announced it is holding a contest for Canadian residents* to win a HyperX® gaming system or other prizes. Register online for a chance to win. Calgary – Digital Alberta is asking for interested parties to create a design concept to be used in a Poster Advertisement for the February 2010 Media Fresh Awards. Design must be suitable for other media such as invitations, promotional mailers, direct mail, static displays, newspaper/magazine advertising, website and print catalogue of which will include mediaFRESH’10’s finalists work and contact information. Professionals, artists who work with digital media and students (both post-secondary and grades 9-12 with an interest in New Media).